Not so fast… Brooklyn Bridge Park’s request for proposals to develop a waterfront residential complex along a 9,600sf vacant lot on DUMBO’s John Street—now owned by ConEd and being bought by the Brooklyn Bridge Park Development Corp.—has already met with formidable opposition. 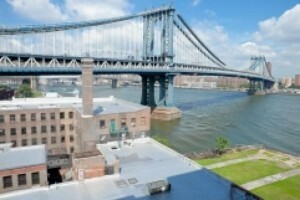 @ Sandy – floods are a BIG problem for housing in BBP. Why do I sense the invisible, and greedy, hand of the shrewd Walentas in this move by BBP’s Myer to open yet another precious parcel of public land to development? When do we get an RFP to develop space for the original purpose of the park, namely space for people to recreate? All we have seen lately are proposals to develop space to line greedy developers’ with gold or bow to the highly limited use pet projects, e.g., the velodrome, of the wealthy, connected gentry. What gives? When do we rein in the Walentas’s of the world whose only motive is to piss on every square foot of available land in our neighborhood for their personal enrichment? @Eye of the People: the development of the John Street portion of the park has been incorporated in the approved plans for BBP since 2005. It does not represent anything new. Your comment, ” in this move by BBP’s Myer to open yet another precious parcel of public land to development?” Is misleading. This was decided a long, long time ago and I don’t think Regina Meyer could divert from the APPROVED plan even if she wanted. Do we have to re-litigate every issue over and over and over in this country? The Mayor at the opening of Pier 5 said that the park was built to withstand hurricanes such as Sandy, and Regina said in this blog article that developers know how to build buildings to withstand storms. It is obvious that she didn’t, as she failed to have the professionals that she hired to design the mechanicals for the carousel and the lights in the park to withstand a surge of 13 or 14 feet. We are living in a different world of global warming, and the question is should buildings be allowed to be built in Zone 1 or 2 coastal flooding areas in NYC. If the answer is yes, then there should be new coastal zoning City building regulations to address global warming realities for new construction. just background static. Officials learned to ignore it years ago. People! Residential development has always been part of the park plan and part of its funding. There is a whole giant new awesome park with tons of space and lots of amenities. None of it existed before! It’s a huge improvement of an already great neighborhood. Stop complaining. Jesus H. Buddha. The John Street lot, still owned by ConEd, has always been shown as a development parcel in the BBP’s management plan and if a developer elects to build there, the PILOTS will contribute much needed M&O funds for the BBP. However, the sane among us question the logic of building next to the water. Even if Councilman Steve Levin were to lead the fight for a new NYC building code, can we hold our collective breath long enough? The building will have long been finished. We need legislation that will do away with the current system of flood insurance, in which the tax payers pay the ultimate bills. It’s obvious they’re tempting fate building in a flood zone like this. But to me the larger question that hangs over both this plot and the planned hotel to the south is: was real estate development the absolute best funding option available for BBP? In a city with as much wealth and ingenuity as NYC, do we have to build condos in our parks in order to pay for them? In 20, 50 or 100 years, people may look back and regret the lost opportunity to build a truly world-class park because real estate interests were allowed to work their way into the process. Yes, there will be some excellent amenities to this park when it’s finished, but people will say it could have been so much better had the towers been kept out. Joral, Real estate interests were invited in after all other possibilities were explored. And there was always a hotel in the plans. But most of all I still think it shall be a world class park which that shall be well maintainted because of the condos. Consider the alternative in Hudson River Park which was headed underwater long before Sandy arrived. I fully expect a segment of the local population to remain up in arms about the park construction and to rail against each new piece that is added. k-stuart. If the new place is built, please take-up residence in the basement. k-stuart, please don’t wear your see-through real estate dress anymore. It’s ugly. Jorale-man, sure enough if you can volunteer to provide stable cash flow through fund-raising to finance the park similar to the monthly mandatory payment a residential complex would provide, the option would be considered. But in practice, there’s no better way to avoid yet another drag on this city’s budget but to finance the park maintenance through residential properties. I do agree with SunFlower though – the code should require mechanicals and electrical infrustructure to be placed on the upper floors and sufficient safety features, like alternative power sources, generators and building wide alarm system to be incorporated in the design. However, this problem is hardly unique to the BBP. It will be a challenge for the entire NYC.